Types of Art: The Bembe carve numerous kinds of wooden figures that represent various spirits. 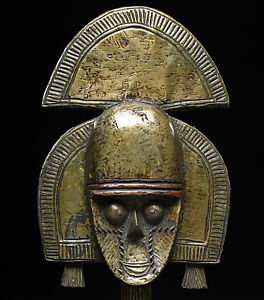 They also carve several different kinds of masks, the most notable being antelope horn masks (elande). Knives, staffs, fly whisks, and divination gourds are also often decorated. Religion: Religion is based on individual and lineage ancestor cults. The Bembe have also absorbed many of the religious ideas of their neighbors. They honor nature spirits (bahomba), the earth spirit (m'ma), and the spirit of Lake Tanganyika, Mkangualukulu, among others.